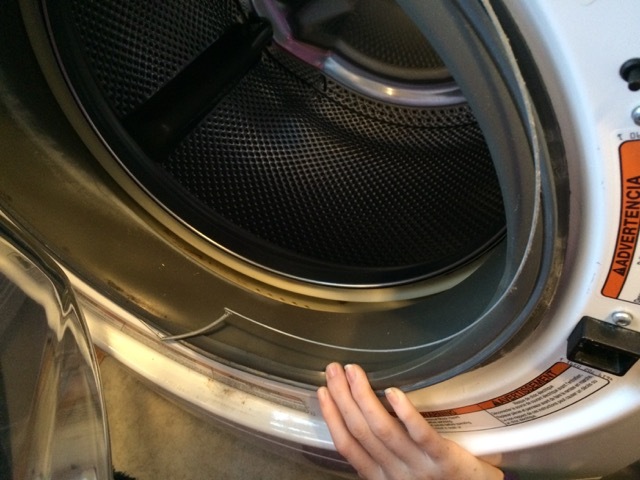 Monday night, we were watching TV when we heard the washing machine go beep … beep … beep … beep. That’s the noise that it makes when something is wrong. When I went to check it, I found that the cycle had finished, but the door would not open. There was an error code on the display as well. I googled the error code and found that it indicated a door latch malfunction. I found instructions about how to activate the manual release, which required taking off the front panel, of course. When I pulled the manual release, the door opened, but unfortunately the release lever broke off in my hand! At first, I was frustrated. 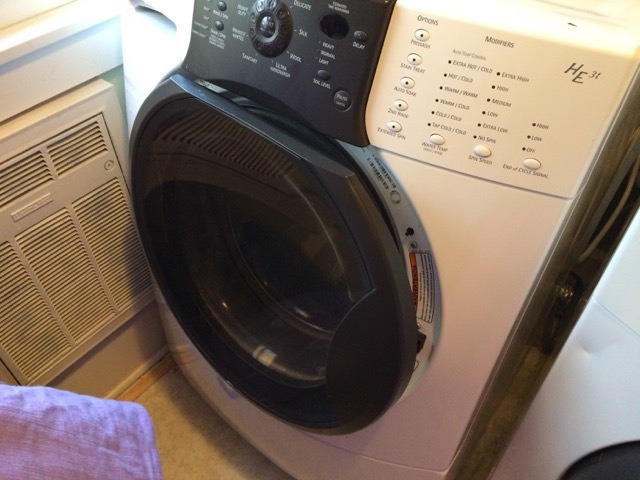 Another washer repair, the washer out of commission for several days, and piles of laundry to do! But then, I remembered my filing cabinet. You may remember that I recently purchased a very nice filing cabinet to curb and organize the endless amounts of paper that always seem to be in our house. I spent the last couple of months rounding up all the paperwork and going through it. A lot of it got thrown in the shred box, but the rest got neatly filed away in the new filing cabinet. One of the folders in the cabinet is labeled “Appliances”. 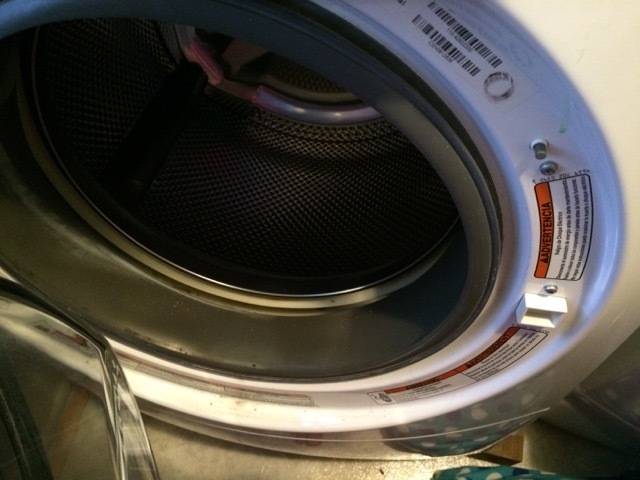 And in that folder are the user’s manual and parts list for the washer and dryer. Finally! A decluttering / organizing pay off! 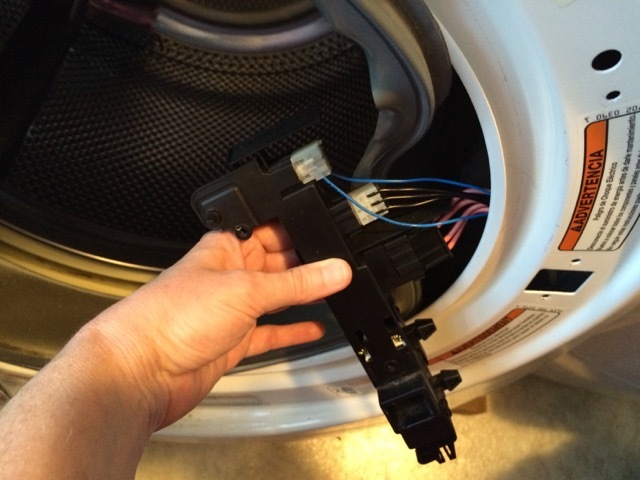 I hopped upstairs, retrieved the folder, and located the part number for the door latch mechanism. I plugged the part number into Amazon.com, and voila! $40 and two days later the new door latch arrived. 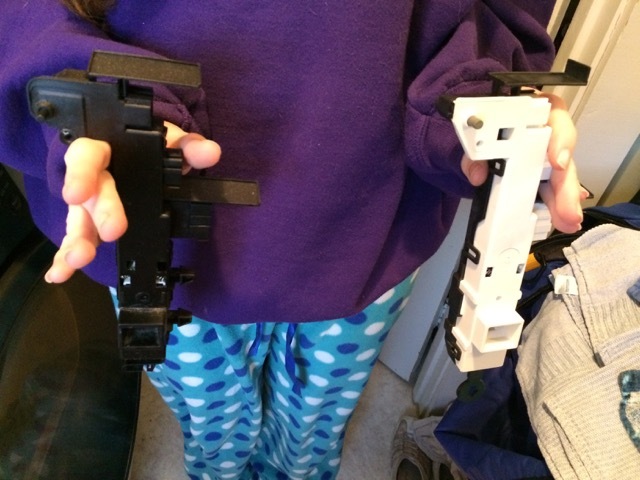 My daughter said she would like to help me install the new latch. I googled instructions (isn’t the internet marvelous?) and we went to work. 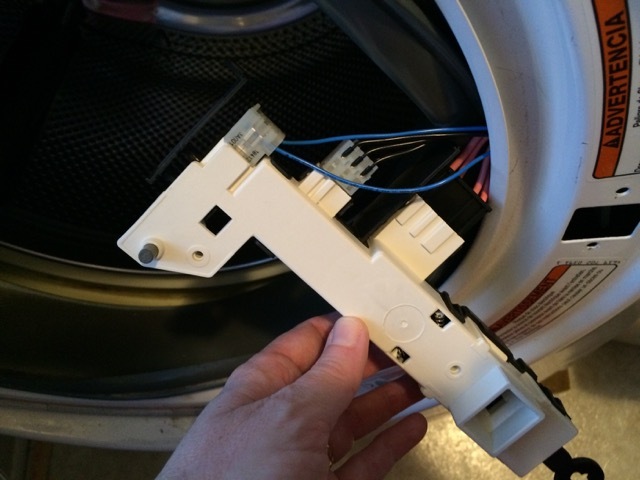 Here is the washer, unplugged and ready for repair. 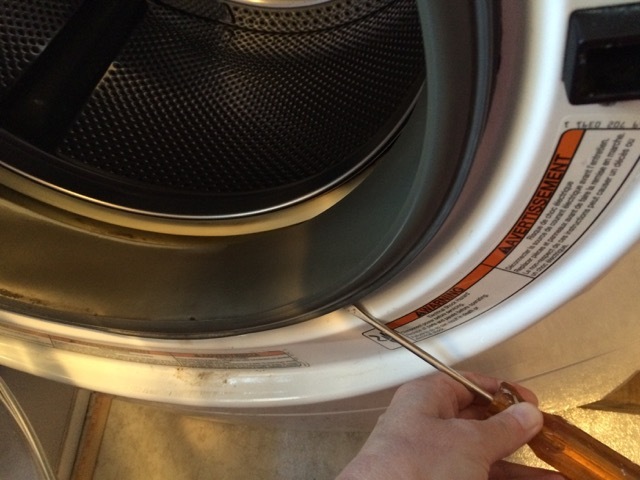 The first thing that I did was use a flat head screwdriver to gently removed the rubber door gasket. Once the door gasket was loosened, I removed the ring spring that held the gasket in place. 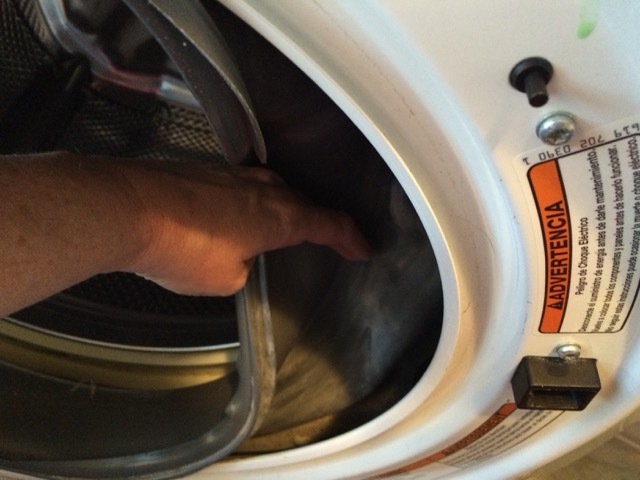 I gently pulled back the gasket on the side next to the door latch and located the door latch inside the washer. 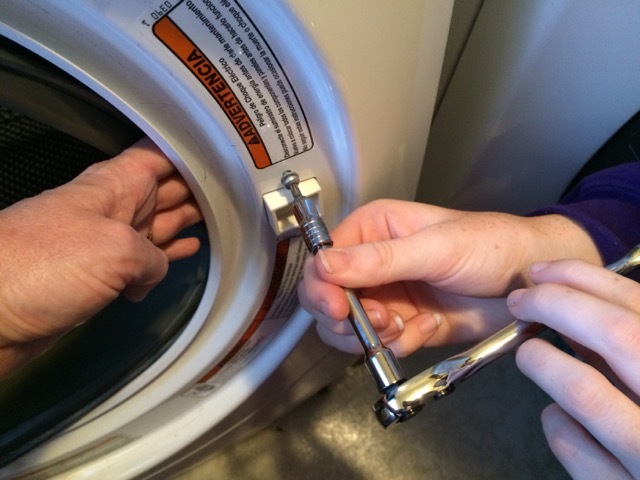 Using a ratchet equipped with the appropriately-sized hex driver, I loosened the three screws on the outside of the washer which hold the door latch in place. My daughter removed the screws and set them aside while I held the latch from the inside. … and unplugged the three sets of wires that ran to it. We compared the old latch to the new one just to make sure that we had the right part. As you can see, the new one is white, and has a larger release lever, but other than that they are the same. 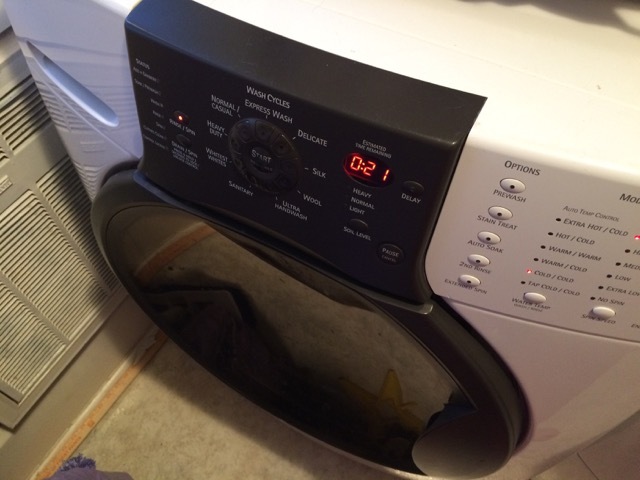 I plugged the electrical connections into the new latch. 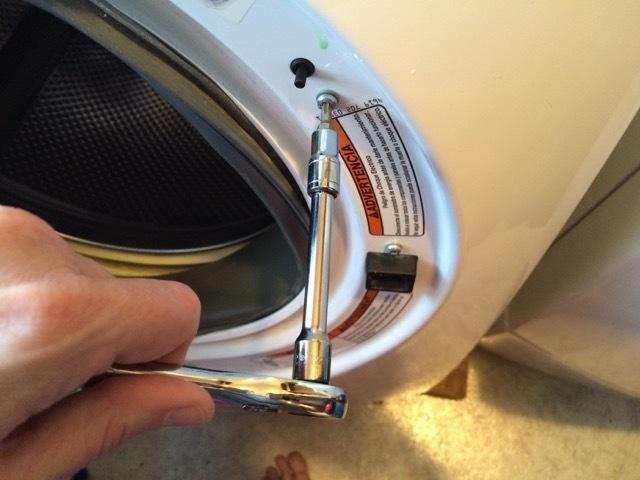 I place the new latch back inside the washer and held it in place while my daughter replaced the screws. I gave the screws a final tightening to make sure they were secure, then we pulled the gasket back into place, and reinstalled the spring ring. Here is the final result, everything back in place, new door latch installed. The door, which would not close before with the broken latch, now closes securely. 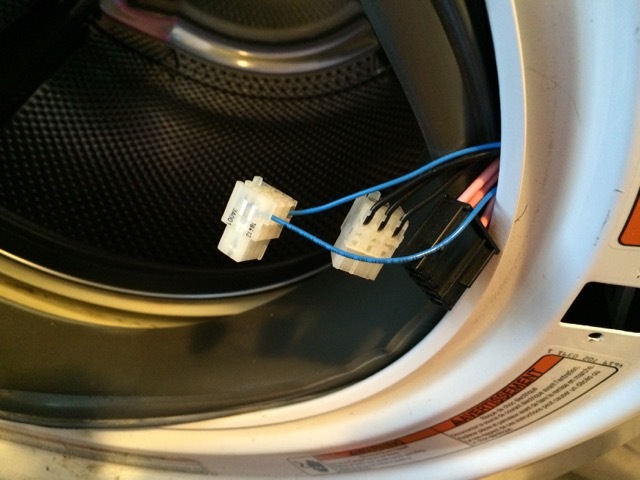 We plugged the washer back in and checked to make sure it was working. I ran an empty cycle and everything is fully operational again. And we have been happily catching up on the laundry. The whole installation only took about 20 minutes, five of which was locating the best tools for the job. And my daughter learned a valuable DIY repair. 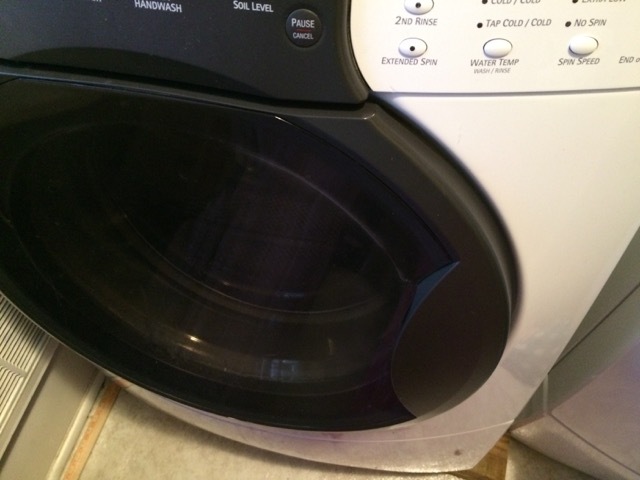 Calling a repairman would probably have cost a couple of hundred dollars. 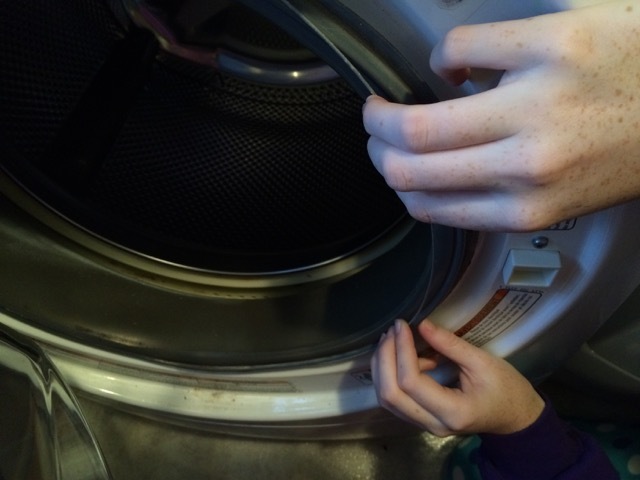 But being willing to do the repair ourselves saved all that money, and allowed us to learn a little something about how the washer works. And it gave us both confidence to tackle future repairs. A job truly well-done!